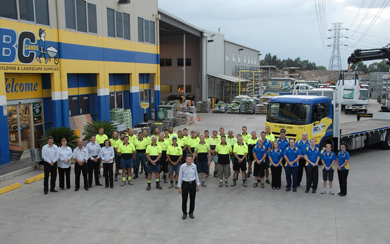 Testimonials : BCSands Online Shop - Building and Landscape Supplies, we supply Sydney's best! 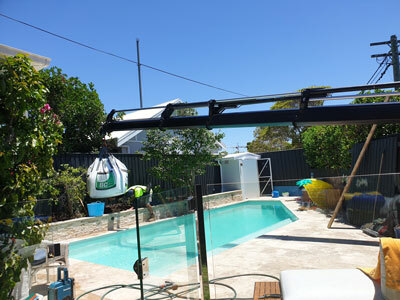 Under the powerlines, through the gap, over the pool... Our 21-meter crane truck in action! I just want to say thanks to Ben who delivered to Rose Bay today. He was super friendly and helpful. The delivery was really tricky and he lifted the bags right in under the powerlines, between the opening in the fence, and over the pool. Then we could drop it straight into the garden. Saved me hours of shifting. I have been using BC Sands and their fleet of crane trucks for over 3 years now. In that time I have seen their fleet, not only grow in size, more importantly for me, capacity. I have many projects on the go at the same time and need a supplier who is reliable and can get the job done. BC Sands fleet of long reach (21m+) crane trucks and their expertly trained drivers do just that, get the job done. I am always particularly impressed with the crane operators ability to place our delivery exactly where I need it. Even through tight spots like windows and door openings, down into pits, across to the other side of the site etc. From my experience BC Sands has the best range of truck mounted cranes in Sydney. Couple that with their amazing operators who go above & beyond to get my materials where I need them & you have an affordable solution that is on par with any mobile crane hire that I have used. I can't recommend them highly enough. I have been using BC Sands crane trucks since they got their very first one. Since then I have seen the fleet grow to be easily the biggest and best of any comparable suppliers I have used in Sydney. Having my supplier lift my materials (up to 21m) without me having to hire a supplementary crane really makes life easy & efficient. A real bonus is you can hire the trucks to do extra lifts around the site which is really convenient and time saving. The rates are competitive and their operators are the best in the business. I have been using BC Sands for my projects for the last 24 months. In that time I have been using their long reach crane trucks often for my job at Coogee. There are many reasons I have gone down this path. BC Sands run a fleet of well maintained late model crane trucks. Their drivers are well trained and go above and beyond expectations. On the odd occasion I have found the 17m crane and their new 21m crane invaluable on my site. I have not been able to set up a tower crane on this site and BC Sands long reach cranes have more than compensated for this. Not only have I been able to easily lift product to the 5th and 6th floor but their skip bag rubbish removal means I have been able to clear the site floor by floor without wasting valuable man hours carrying the rubbish down, being able to do this also leads to a safer worksite. I have utilized the fact that BC Sands only charge by the lift and not an overall crane price. This means that if we only need two or three bags or pallets of bricks, blocks etc. we are only paying for those lifts. I have also hired their truck on occasion, as they have a minimum 2 hour hire instead of the usual 4 hour hire. This can save big dollars and means I can move any material around site when required. 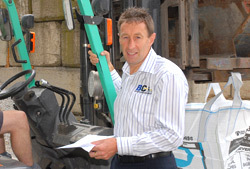 BC Sands offer the full package; good drivers, large fleet and a full range of quality products. I would highly recommend their services to any who asked. Little gardeners deserve the best Veggie Mix! Thankyou BC Sands for our delivery this morning! So excited for our first veggie patch to take shape. Our little helpers will be sure to wear their gardening hats, the middle one has not removed it since this morning :). "Have ordered several times, and always on time and good quality, very happy with the service provided." I found it very easy to use the ordering system and the delivery was made right on time. I will definitely use this company again. "Great communication from automated messages. Well timed delivery, kind driver, skilled reversing down a difficult driveway." "Truck arrived and was unloaded quickly was amazed at the value for delivery service." Phone staff member was really helpful when I called for some assistance. Although he didn't take my order (I ordered the next day after re measuring) he was happy to take his time to explain the finer points of laying turf. The delivery driver was very accommodating and friendly. Great experience all round." "The website is exceptional that it covers all concerns with delivery with some simple clicks. Our delivery person was very considerate in how we were going to use the materials and arranged them out for easy access. Much appreciated BC Sands." "Delivery driver waited when he arrived as not to wake up the other residents. Delivery was prompt and the customer service was great. Would use this company again." "The driver delivered our Soil & Mulch and was awesome. Nothing was a problem, dropped the materials exactly where I wanted them and was very pleasant to deal with. The SMS's advising me of the timing and delivery was awesome. BS Sands - you under promised and over delivered. Sensational Service and would recommend to anyone." "Great service, very helpful. Highly recommend, this is the best, most efficient service I have had from any company for ages. It was so good I ordered online and then had to change something, they were friendly, helpful and it was all sorted out quickly and easily. Highly recommend them." "Very good service. I wasn't home at time of delivery and the driver did it all without me Excellent!!" "Delivery man is extremely kind and helpful Goods arrived in premium quality as it shown online. SMS system is very good, consumer knows ordered goods is coming on schedule." "The driver was fantastic. I always love two things about your service. 1) every time I call, you know my phone number comes up and greet me by name, having this noted from previous orders. That's awesome. 2) The SMS I get prior to every delivery, is very reassuring to know that the order is definitely on its way. Your drivers are always excellent and courteous. Please thank them. Especially when I know manoeuvring those large flat bed trucks through the narrow streets of the inner west can be quite difficult!" "Staff provided friendly service with excellent product knowledge. I viewed your website, no issues easy to navigate. "From counter staff to the delivery driver ... all were awesome and very helpful ... the driver was a legend." "Very good all round. I'm looking at doing more work around my home and will be using BC Sands." "I was really pleased with the quality of the soil I had delivered. Also it was a generous amount. Another thing that impressed me was that I received texts to remind me of the delivery & it came within the allotted time - well done!" "Simple procedure to order soil and garden mix for garden project. The driver who delivered was friendly and professional. No problems experienced." "Info great. Delivery great. Product better than expected so far. Thanks to your team. Website does its job, your info and customer care is what is working for you." "Lady who served me at BC Sands Taren Point was very helpful and delivery man was very helpful as to where to drop the bag of sand for the most convenient for us." "I did shop around and whilst BC Sands were a more expensive option the assistance with my questions, quality of the product and such a obliging delivery man with great driving skill was excellent. I have previously used another supplier and was very unhappy with their service and now wonder how they are still in business." "Absolutely delighted, we will be back." "All very good and easy." "Ordering was very easy. We also got same day service." "Very professional service & prompt delivery." "Very satisfied, received same day delivery." "Delivery driver was very friendly and helpful." "The driver put the 2 loads of top soil exactly where I had asked him to! What a legend!!" "Love that you guys have a fruit bowl at Taren Point......often the only food I get until dinner time...... very busy!!!!" "Even though I used the online store I think I still prefer to talk to a human! Either way I'm very happy with the service and the range or wood you have (not just the top grade or bottom grade) and really like the saw mill offcut product (even though I haven't checked it out yet - still in the bag). I have a wood fired oven so the long lasting heat isn't as important to me (the bricks retain heat for a few days) so the choice of the cheaper wood is awesome." "I found the [BC Sands online shop] experience simple and straightforward. Clicking on items to see a larger view is always a winner. Also I had made a phone call as well and found the staff friendly and professional. The product is of high quality - not damp, like another supplier - and therefore I feel the extra cost is worth it (the other supplier had delivery included in the pricing structure)." "I would love to rate my experience with your business. I have just installed a slow combustion heater at home and was looking for wood, so I typed in "sydney firewood" and BC Sands was one of the first sites to come up. I looked through your site and got a price then searched other sites to compare. The reason I came back to you was the simplicity of your site. I could see what I needed and it was easy to order and I knew the price. Finishing the transaction as a new customer was also a breeze, order completed and confirmed by you in around five mins, brilliant. The other thing was the link to the FAA which no one else has and gave me peace of mind about your product." "The product is also excellent, we had our first fire last night and the wood burns long and hot, the pieces are just the right size and I don't have to spend time with a block splitter trying to make them fit." "It was a pleasure doing this purchase. 1. I did a web search and after looking at several felt that BC Sands would provide the service I wanted. I was not disappointed. 2. It is a very easy web site to navigate. 3. The delivery person arrived EXACTLY at the time stated. He was also friendly and helpful. 4. I have used another supplier for fire wood previously-the 500kg reusable bag is tidy, assisted in the management of the wood and is great for recycling. 5. Definitely using BC Sands again."